The good ol' family restaurant... So often, we look at these places as only the last resort to appease the kids while still eating acceptable food (most of the time at least). Within this category of restaurants, you have the decent, bad and ugly. Yah, I guess it's really hard to find excellent food at a chain restaurant. I'm not being biased, it's just difficult to get away from generic food when the whole premise behind a chain restaurant is consistency. Of course consistency among these restaurants are in theory only. Let's just assume that consistency is a virtue in this argument. And that alone makes it attractive to families. Hey, everyone knows what to expect, right down to the kiddies (who might be picky, like mine). As such, there is a formula that the kitchen staff follow to replicate the same dishes consistently throughout the whole chain. So, for those who argue that chain restaurants lack creativity, uniqueness and overall "good" food, I think they are missing the mark. With that being said, there are better choices among the many chain restaurants. If you know me, I just don't have a great love for ABC Country Restaurant. Yes, I'm picking on them and some might say that it is unfair, particularly my friend Pomegranate. However, from a personal point of view, I just don't like the place. It's quite possible the food is just too "home cooking" for me, albeit pretty bad home cooking. So, the family chain restaurant discussion has brought us to East Side Mario's. Yes, I know, it's not authentic Italian food. Tell me a chain restaurant that serves truly authentic food and I'll tell you that Showgirls is a good movie. Before we had any locations of ESM here in BC, I had already heard about their locations in Ontario. Strangely enough, it was on Redflagdeals' hot dea ls forum where people would post about ESM. There were people who loved it and those who loathe it. For me, it seemed like another version of the Olive Garden. I have to admit, the first time I visited ESM, I didn't mind it. Subsequent visits made me realize it wasn't really all that cheap eating there despite the unlimited soup, salad and garlic loaf. But there I was again, visiting ESM in Kelowna on our road trip 2 years ago. It was convenient and good for the kiddies. Today, the whole family including the grandparents stopped by ESM for lunch. Being that it was a Wednesday, the kiddies got to eat for free assuming for each, we order a full dinner entree. So, instead of their inexpensive lunch specials, I ordered a Spaghetti con Funghi for $14.99 (more on that later). Yah, some might argue that I essentially paid for the kids meal right there; but whatever, by virtue of ordering a dinner entree, I got unlimited salad or soup and garlic loaf. 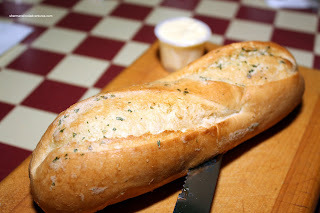 And about that Garlic Loaf, it is pretty darn good. Hot out of the oven, it's crusty on the outside, soft and fluffy on the inside. 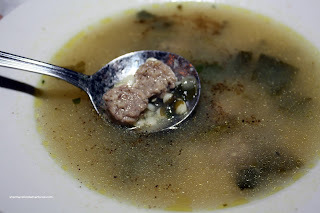 I decided to have the Italian Wedding Soup and despite its oily appearance, I like this soup with its tiny meatballs, orz o and greens. 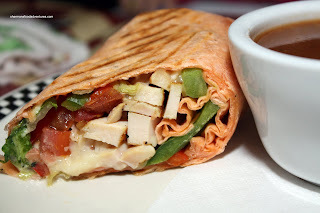 Viv had the 1/2 Mariboli Wrap which consists of chicken breast, lettuce, peppers, bruschetta, cheese and pesto mayo in a grilled sun dried tomato wrap. Nothing Earth-shattering by any stretch of the imagination. The bottom line is that Viv liked it. 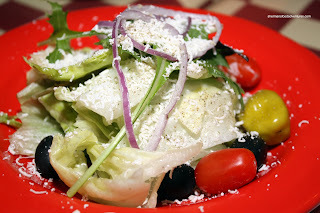 It included a full-sized salad and a cup of soup. Not bad for $10.50. 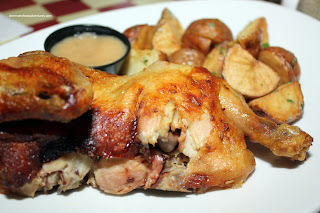 My dad had the Half Rotisserie Chicken with roast potatoes. I've had this countless times in the past and it can be hit and miss. It really depends on your luck. Sometimes it turns our tender and other times, dry an d not-so-good. It could possibly depend how long the chicken has been sitting around for I suppose. Fortunately, this time around, it was moist and flavourful. Since this was a full-sized dinner entree, he had the choice of unlimited soup or salad. 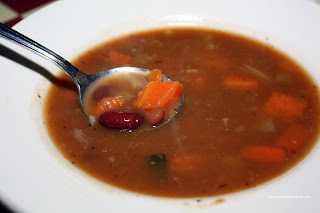 He decided on the Minestrone which in my mind is passable. I've had much better, albeit in a real Italian restaurant and that's not a fair comparison. 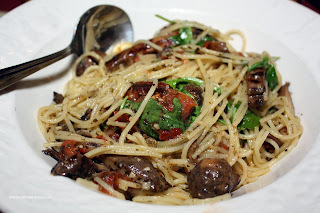 For my main, I had the aforementioned Spaghetti con Funghi which, as the name implies, consists of mushrooms (portobello and white) sauteed with roasted tomatoes, arugula and basil then tossed with Parmesan, Romano and olive oil. When I often mention the trendy, oilier pastas, this would be a prime example. With little to no sauce at all, this is essentially pasta tossed in olive oil and ingredients which include tomato, not tomato sauce per se. I personally like this type of pasta and this one was okay. I would've wished that the pasta was a bit more al dente and maybe a bit less oil. However, given where I was eating, it was fine. Plenty of flavours abound including the mushrooms, herbs in the olive oil and tangy tomatoes. Again, for those who will want to flame me for not bashing the pasta at East Side Mario's, I must reiterate that my expectations are tempered. I'm not expecting the same type of pasta that I would find at a real pasta house. 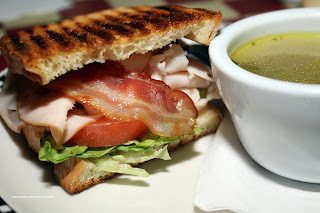 Something that isn't remotely Italian is the 1/2 Chicken Club which also included a full-sized salad and cup of soup. I know, it's not a real Italian restaurant, so a good chicken club was not really a stretch. In fact, it not was bad (even though they used deli turkey meat). Look at it, it looks good to me at least. Now for the real reason we were here in the first place, the free kid's meals! Seeing that there is no grilled cheese on the menu, my son opted for his second "go to" food - Cheese Pizza. I gotta hand it to ESM, the kid's portions are pretty big. The day that my son can finish that pizza is the day he gets his driver's license. Nothing special about the pizza really. 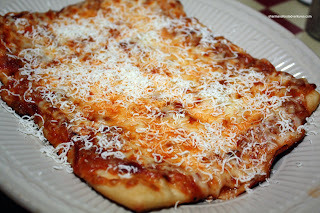 It's got a relatively thin crust, sauce and lots of cheese. Pretty standard. The meal includes choice of beverage and ice cream for dessert. 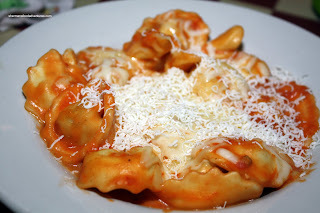 My daughter really didn't decide on her order, we just picked something for her which was the Cheese Cappalletti. I have to say this is almost as big as the actual entree size version. Actually, I'm not a big fan of this particular pasta. No, it's not because there is too much sauce (LOL...). I just find the cappalletti too doughy. So really, ESM is a family restaurant, plain and simple. With that being said, I don't mind the food here despite what others think. Sure, it's not going to strike any fear into authentic Italian eateries and it's quite reasonable for me to visit one over ESM. However, if I want to just go out with the family, with the kids eating free and have reasonable expectations, then ESM fits the bill. Nina, yes, it's a decent family restaurant. I know there are some detractors, but for me at least, it's way better than places such as ABC and Ricky's. Tell me a chain restaurant that serves truly authentic food and I'll tell you that Showgirls is a good movie. Well, the first question would be your definition of "authentic", considering that, in this side of the world, it does not necessarily has a straight meaning. If you allow certain liberties, some BBQ chains in the US are quite decent. Or, if we can take some liberties with burgers, you can't deny that White Spot is good for what it is. (BTW, you don't have to say Showgirls is a good movie). when i was leaving squamish, esm was moving in. they had some staffing problems and didn't open before i left but i was excited to try something new. in squamish, ANY new restaurant calls for a celebration. if i knew about the unlimited bread and salad thing, i would never leave. probably a good thing they were still closed! Trisha, I gotta admit, the unlimited soup or salad and garlic loaf is pretty good. I usually have 3 bowls of soup minimum! LOL Tia! Such an Asian thing to do... but so TRUE! I'm with you there! Isn't Santouka Ramen a chain restaurant? I guess you will have to tell us that Showgirls is a good movie. Go Jesse Spano! Well, technically yah Santouka is a Chain restaurant. I guess I shoulda specified that I was talking about North American-based chain restaurants. However, I guess if I had a few cool Sapporo's I could like Showgirls... "I wanna be a dancer!!!!" Sherman, good review. Nice photos too! Thanks for the fair perspective on the food. We try to walk the line between "true authentic" which often means actually offending the average Canadian palate with things like arugula and extremely simple sauces, and "mass appeal" which means trying to do the right things like using real EVOO and DeCecco pasta. Every once in a while we try something a little outside the norm and it sticks (we had a fig salad long before Presidents Choice decided it was "safe" enough) and then again sometimes they don't (we tried linguine and clams three timnes before we gave up). But in the end, you've got it right; we just want to be a decent place for families to eat without breaking the bank. Thanks again for the frank review. 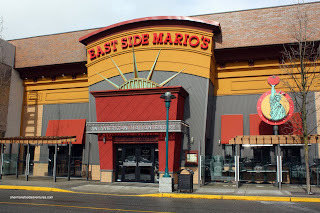 I think I've been to every singe East Side Mario's in Alberta. Back when I had to travel a lot for work, it was a guaranteed good meal with ample veggies, and I never felt weird eating there alone. It's also been very good to me when I was planning student conferences: being able to make reservations for 30+ people and always offering a good set menu for my group was a god send. I <3 the Firecracker shrimp bowtie pasta; but still miss the Chicken peppercorn penne! ESM, yes, I am not afraid to admit I like the place. After all it suits all my needs. And that's what it is all about. Elaine, I'm with you there... Some decent eats. I never felt weird eating there alone.